A common sign of appendicitis is deep tenderness at the McBurney’s point (the location of McBurney’s point is about 2/3 the distance starting from the umbilicus to the right anterior superior iliac spine); however, young children and pregnant females may experience pain elsewhere in the abdomen. Once a diagnosis of appendicitis is made, an appendectomy usually is performed. Antibiotics almost always are begun before surgery and as soon as appendicitis is suspected. The majority of appendectomy operations are typically emergency surgeries, so the patient needs to follow the instructions given by the surgeon. In general, the patient is advised not to eat food, although, with the symptoms, they are usually not hungry anyway. The patient may be treated with medications to reduce or eliminate nausea and vomiting; IV antibiotics may also be initiated before surgery. Appendectomy is most often done in the operating room after the patient’s skin has been shaved to remove hair and swabbed with a germ-killing solution; sterility precautions are taken to prevent infection. 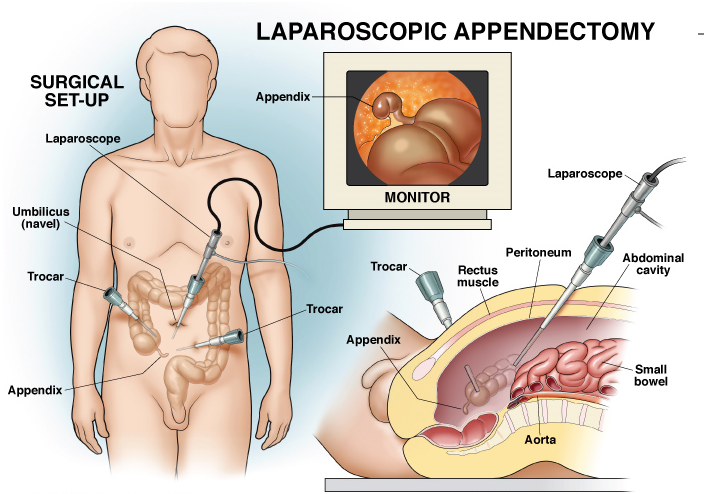 The appendix may be removed by an open method or the laparoscopic technique. The open method requires a 2 to 3-inch incision in the lower right–hand side of the abdomen to remove the appendix, while the laparoscopic method uses several small incisions in the abdomen and the use of a laparoscope to visualize and then remove the appendix.